1 – Entrance: Your tour starts from the south wing, built on a design by Guarino Guarini decorated with bas-reliefs representing telamons and some episodes of the twelve labours of Hercules attributed to Giovanni Battista Casella, coming from Venaria. Walking under the main staircase, you will reach the atrium on the ground floor, decorated with bas-reliefs and plasters designed by architect Benedetto Alfieri. 2 – Staircase: Next to the atrium, two twin staircases lead to the upper floors. After the death of Charles Felix, his widow, Maria Cristina di Borbone, had the right staircase restored, and this was rebuilt in marble with a refined wrought iron railing bearing the entwined initials of the queen, designed by Ernest Melano. 3 – East Gallery (Galleria di Levante): Symmetrical with respect to the main hall, it leads to the royal apartments. Frescoed by Andrea Piazza and Carlo Pagani in the twenties of the nineteenth century with classical subjects, it offers nice effects of optical illusion. 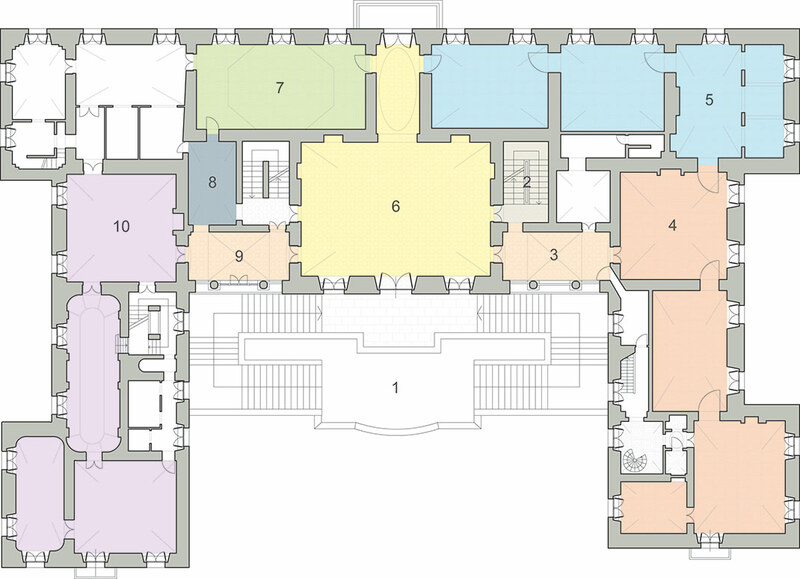 4 – The apartments of the Queen: Royal apartments consisted of: a parade hall, a hearing room, a master bedroom and private and service rooms with separate entrances. The parade room of the queen was connected to the master bedroom of the King. The frescoes were painted by Andrea Piazza and Carlo Pagani with interventions by Luigi Vacca and the subjects of the paintings are inspired by classical mythology. As for the wooden floor, which dates back to the twenties of the nineteenth century and wooden furnishings, partly lost, they were created by a famous team of wood sculptors led by Giuseppe Maria Bonzanigo. 5 – The apartments of the King: The apartments of the King consisted of: a parade hall, a hearing room, a master bedroom and private and service rooms with separate entrances. The frescoes were painted by Andrea Piazza and Carlo Pagani with interventions by Luigi Vacca and the subjects of the paintings are inspired by classical mythology. As for the wooden floor, which dates back to the twenties of the nineteenth century and wooden furnishings, partly lost, they were created by a famous team of wood sculptors led by Giuseppe Maria Bonzanigo. 6 – Main hall: Frescoed entirely with the use of trompe-l’oeil in the twenties of the nineteenth century by the painters Luigi Vacca and Fabrizio Sevesi, the complex decoration of fake architecture, pictorially depicting the myth of Niobe, it looks like a real sculpture. The walls are painted with the chiaroscuro technique with false columns and statues representing Niobe and her children, while the central part of the vault is characterised by coloured frescoes depicting the Olympus with Latona, Apollo and Diana. The mythological theme was commissioned by Charles Felix who, in 1817, saw the sculptural group, when, with Maria Cristina (cousin and sister in law of Ferdinand III of Tuscany), he went to Florence for the engagement of Maria Teresa (daughter of the Grand Duke of Tuscany) with Prince Charles Albert of Carignano. 7 – Gallery of the Prior: facing north and connected to the chapel, it reproduces the appearance of the Castle as it was in the second half of 1700, just like the atrium on the ground floor. Decorated with fine stucco, it was decorated with thirty-eight portraits on the walls. 8 – Chapel of Santa Cristina: Located next to the secondary staircase of the castle, today it does not have the altar mentioned in the inventory of 1824. The vault depicts the assumption into heaven of a martyr, while, at the corners, we find pairs of cherubs. 9 – West Gallery (Galleria di Ponente): Symmetrical with respect to the main hall, it leads to the Chinese Halls. Frescoed by Andrea Piazza and Carlo Pagani in the twenties of the nineteenth century with classical subjects, it offers nice effects of optical illusion.